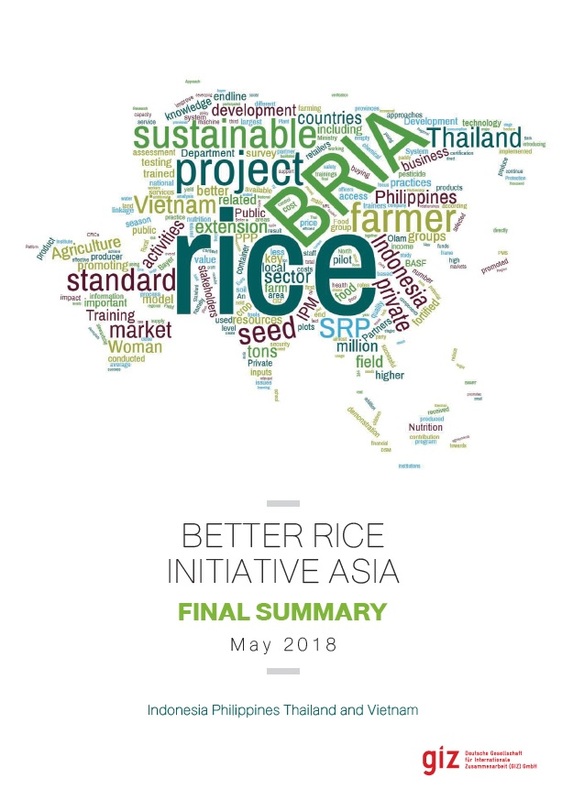 Objectives: Promote sustainable rice production, strengthen value chains, raise incomes of rice farmers, develop capacity, and contribute to improved nutrition of the population. 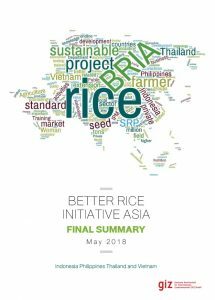 Three hundred-seventy five centres for sustainable rice production will be established until 2017 in the three provinces of North Sumatra, East Java, and Central Java. One hundred-twenty five trained agricultural advisors will teach 7,500 rice farmers, which will act as multipliers in their respective communities. Producers of cooking oil and rice millers are enabled to fortify their products with micronutrients such as vitamins, iron and zinc. BRIA supports the Indonesian Government in establishing social security systems which provide nutritious food for poor people. 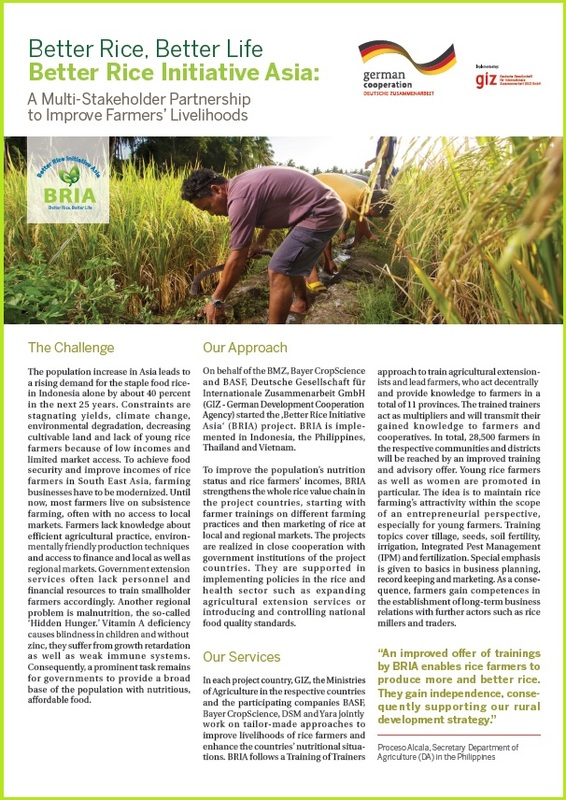 As a first step, BRIA conducts studies showing the effectiveness of fortified food as potential means to fight against malnutrition. Two hundred communal agricultural extensionists and lead farmers in the provinces of Iloilo, Aurora and Southern Leyte will be trained as multipliers to improve farmers´ knowledge on rice farming and marketing of their produce. 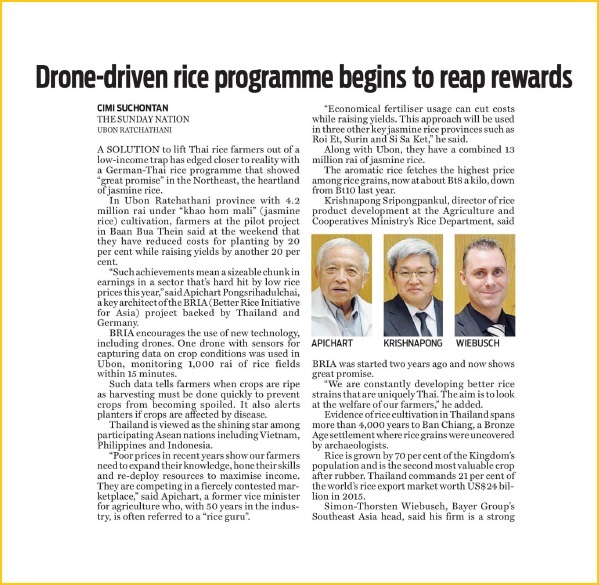 Innovative marketing channels for rice farming will be established. 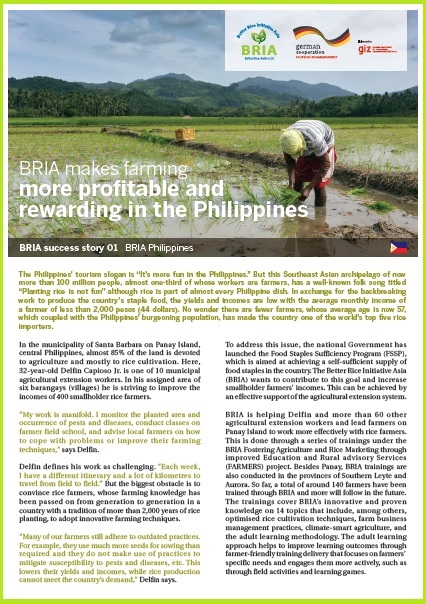 BRIA supports government policies on Food Self Sufficiency, in order to decrease dependency on rice imports. The project aims to increase the yields of 8,000 rice farmers by 20 percent and their incomes by 15 percent. Trainings focus on efficient and conservational farm practices to, for example, reduce the application of toxic crop protection substances. 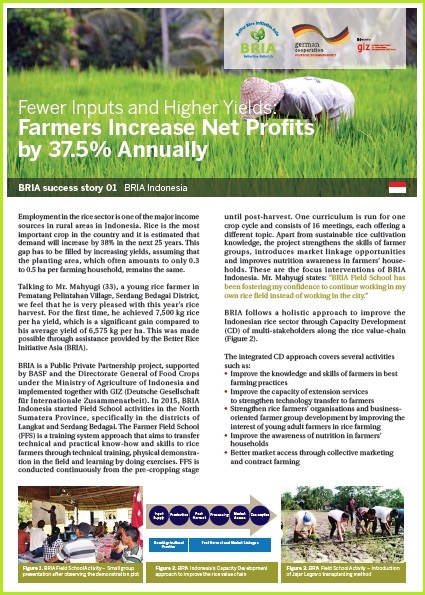 With the help of trainings in so-called Community Rice Centers (CRCs) supported by BRIA, smallholder farmers can increase their incomes by up to 20 percent and reduce pesticide application by 40 percent. 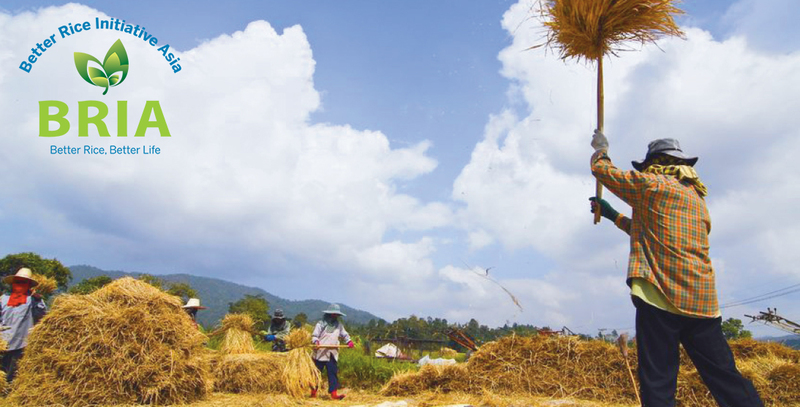 To decrease postharvest losses, improved postharvest management strategies, such as optimized storage and drying techniques, are developed together with the Thai Rice Department. The project supports the processing of byproducts in rice production. In about 200 CRCs, lead farmers will be trained as multipliers for sustainable rice production in the northeastern provinces of Ubon Ratchathani, Roi Et, Sisaket and Surin, reaching a total of 10,000 farmers. 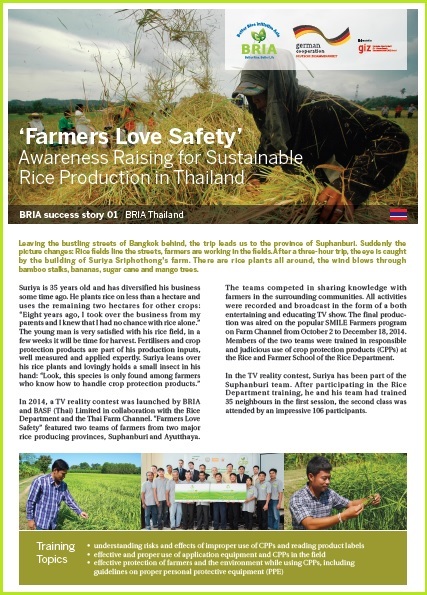 BRIA, together with its public and private partners, produces an edutainment TV show in which two teams of farmers from Ayutthaya and Suphanburi provinces impart knowledge about responsible and judicious use of production inputs to their peers. The show is aired on an agricultural channel. BRIA is engaged in the provinces of Dong Thap, Hau Giang and Kien Giang. The objectives are to improve rice quality and farmers’ incomes, promote market linkages and enhance the capacity of Farmer Cooperatives by fostering multi-stakeholder partnerships between farmers, rice millers, input suppliers and government extension service workers. In total, about 3,000 rice farmers will participate in trainings and consequently produce several thousand tons of socially and ecologically sustainable rice annually. Introduction of rice quality standards will facilitate marketing, raising rice farmers’ incomes by up to 20 percent. Regional Project Director of Better Rice Initiative Asia gives an interview to NBT World Thailand about the rice situation in the country.